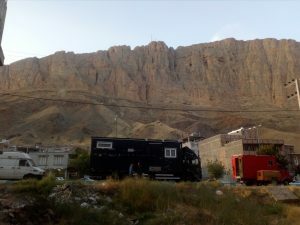 We are prepared and well rested for arriving at the Iranian border this Wednesday, September 19th. The day before, we decided to stop for the night a few kilometers before Iran. We will stay at the base of a splendid castle where we will spend the evening to speak with the guard who is Kurdish and who speaks English very well. Alternating between teas and whiskeys (we enjoy this last evening where we can have a drink without hiding), this exchange will allow us to better understand why this region is so populated by military. 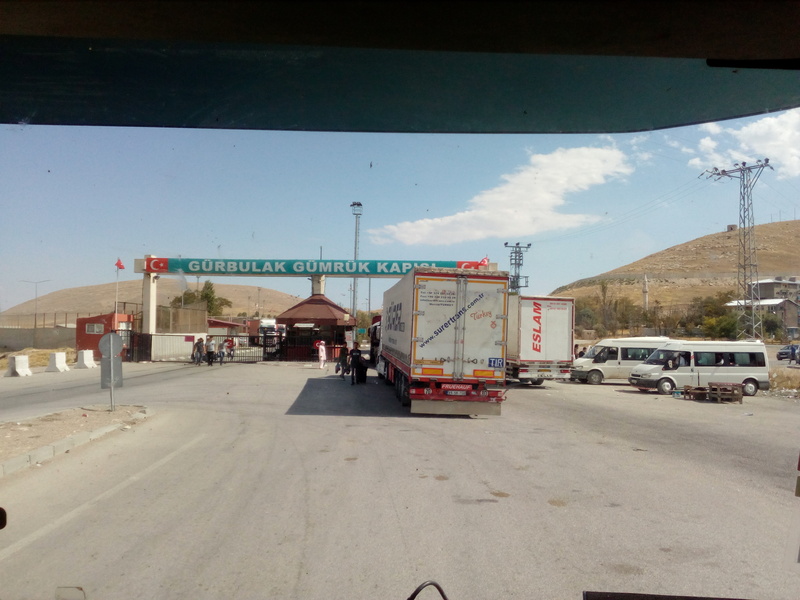 Tensions are high and Turkey wants to keep its sovereignty over this part of this mostly Kurdish territory. The next morning we screw some wooden plates in front of the speakers to hide at least the horns, we cover the vinyls and live machines with fabrics or clothes and transfer the wine cellar in a more discreet place .. . Although Iran has opened up to the rest of the world in recent years, especially tourism, these practices are strictly prohibited by law, so we prefer to play it safe. We arrive at the first border post around noon. Heavy transport trucks pile up in a queue but do not stretch on kilometers as we have already seen before. Out steps a man with a decided stride. This is called a “fixer”. A fixer is someone who, for a few euros, accelerates the passage to the border. He’ll make you pass in front of the queue and help you stamp your passports and notebooks in less time than fixing a cup of tea! It often avoids thorough searches of trucks. We stop the trucks, exchange a few words with him. We had previously agreed with the rest of the team we would accept services of this kind. It seems to work perfectly, this average Joe makes us backtrack to the border station to change lanes and makes us take a different path, using the exit to enter. 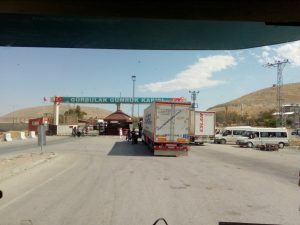 In less than a minute we pass in front of all the other trucks and vehicles, and this without even a look of the border guards yet armed and in uniform. Even though they seem to take their job serious in this country, despite everything, this kind of practice seems quite normal. Our guy is pointing towards a building where we will travel to Iran. And yes, with our wanderings, we are still in Turkey. We stop our trucks in the middle of a lane, go out and walk in the direction of officials that our fixer points to. 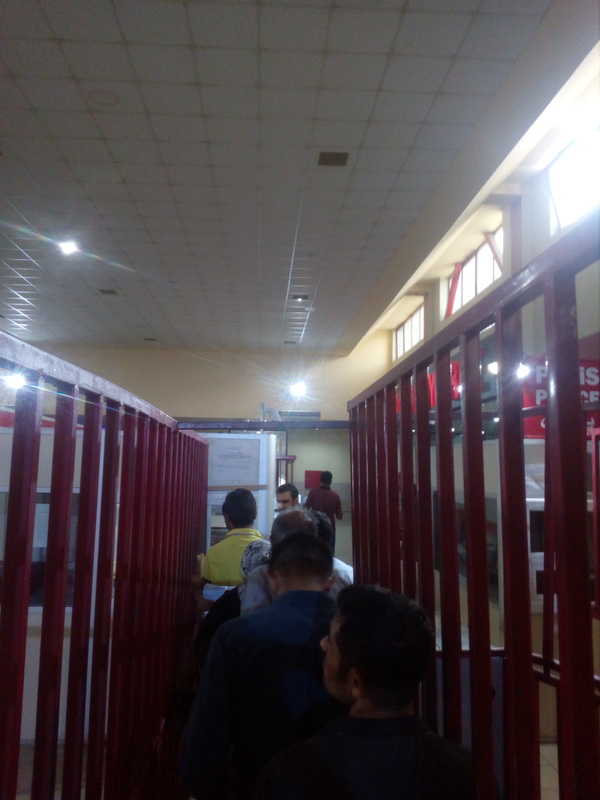 We present them our passports, they present us a hall where a long queue is piled up in order to be stamped and processed. 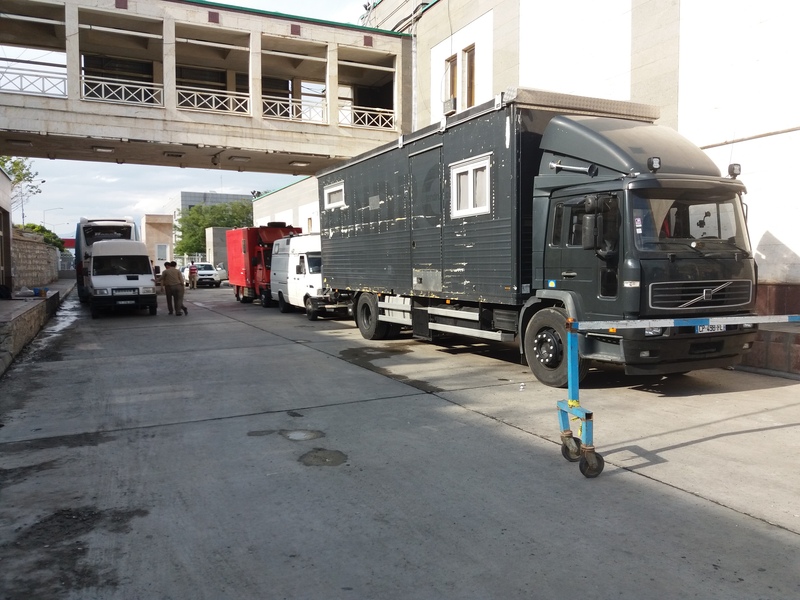 For your information, we have paid this fixer ten euros per truck. We have not lost much, and even if the service of these people is more generous most of the time, he still has introduced us quickly within the border station. Waiting in the queue is somewhat unreal. We do not really understand who is trying to steal places, who stamps what and what is waiting for us afterwards. After a good hour of wet waiting (especially for girls, we donned the dress of rigor: veil, long sleeves, pants), here we are stamped! 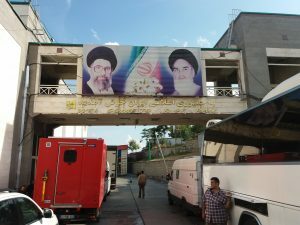 We can move the trucks to the gate we expect to open on the Iranian border post. Passports checked by a new type of man wearing a new type of uniform. 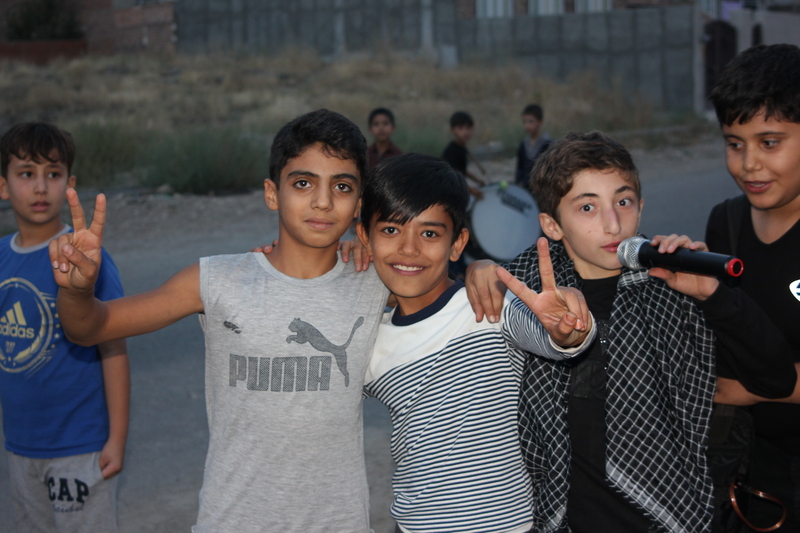 Everything is ok, welcome in iran! 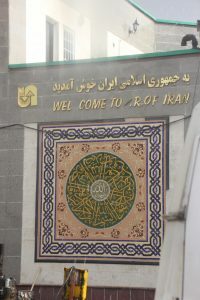 Welcome to the Iranian steps. We will hire a new fixer that will prove to be more effective. We give him our CDP notebook (carnet), our passports and copies of our passports. 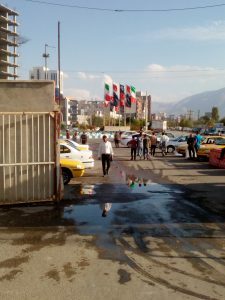 The man lugs you in the Iranian services, you enter through the rear door and has influence as we are hardly asked to open the doors of our vehicles. Reading this here in this way, this practice must seem to you more than doubtful, but it is not so. Forget your experiences at home, these “fixers” are under the watchful eye of the border guards, they will not steal your passports and do not steer your trucks. 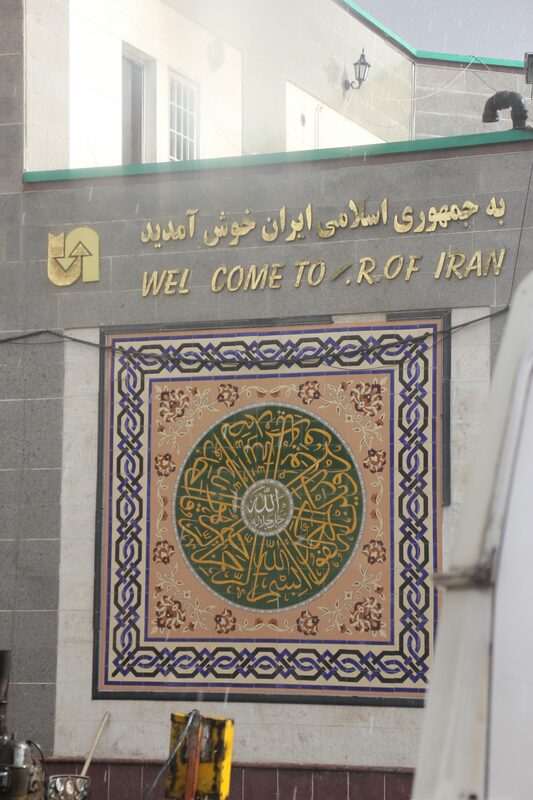 They are a real help, especially at the Iranian border post. Indeed, this is where you have to get out the CPD cannets, check the accuracy of the chassis number of your vehicle and according to the mood of the guard, search your vehicle. Even if you have nothing to hide, this step, added to the rest of the organised chaos, is never pleasant. Help for papers can be an interesting service (but not essential), but when they offer you to change money, just REFUSE! They will seduce with stories and rates most interesting, if you do not want to regret once past the barrier and the tension less, do not capitulate. Just refuse. That’s what we will do, yet he will not back down during the few hours of waiting. 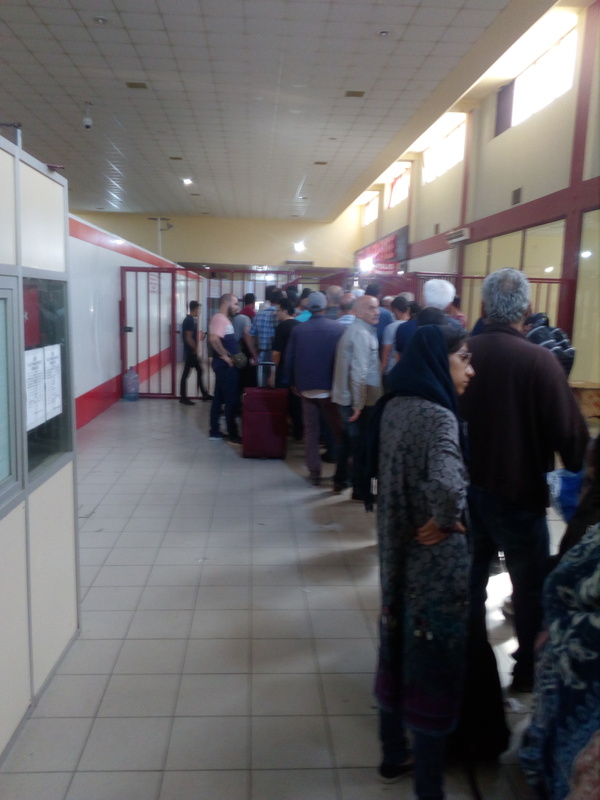 What we thought was true in Turkey a few hours ago is nothing compared to what we experience in this waiting area. We eat peanuts and smoke cigarettes with fixers and border guards, as well as with these “black shirts”. We understand that they have authority and that they sign our papers. One of them even spent many years in France. He leaves us his contact details, if we need anything, we can contact him. With a lot of blablas, lots of stamps and no worries, they open the barrier on Iran for us! It is not yet time to rejoice, we must now reward our fixer who guides us to a place where we park to finalize our business. He announces rates that make us understand, he takes us for tourists with weak loins! 60 euros for the heavy weight because it is a big truck (while the “work” has nothing to do with the size), and 40 euros per van. We will get by for 30 euros per vehicle. In the end, the fixer is a good help, especially for a large group like ours, but is not essential if you do not want to take it. So here we are in Iran. It is not without emotions that we travel our first two kilometers in this country which is a turning point in our journey. We are all aware that this country is the first to really make us leave Europe and all the benchmarks we could have before. We arrive at the gate, the guard will not even bother to check our assurances. He sees the size of our convoys and the plates registered French, he signals us to enter the chaos beyond the gates of the border station. Here we are. For real. country: Iran, language: Farsi, year: 1397 (and yes, Iran operates according to the Persian calendar which is a solar calendar). How, just with a border, can we feel such a change in the atmosphere? The identity of this country has a strength and a particularity that contrasts with everything we have known before. 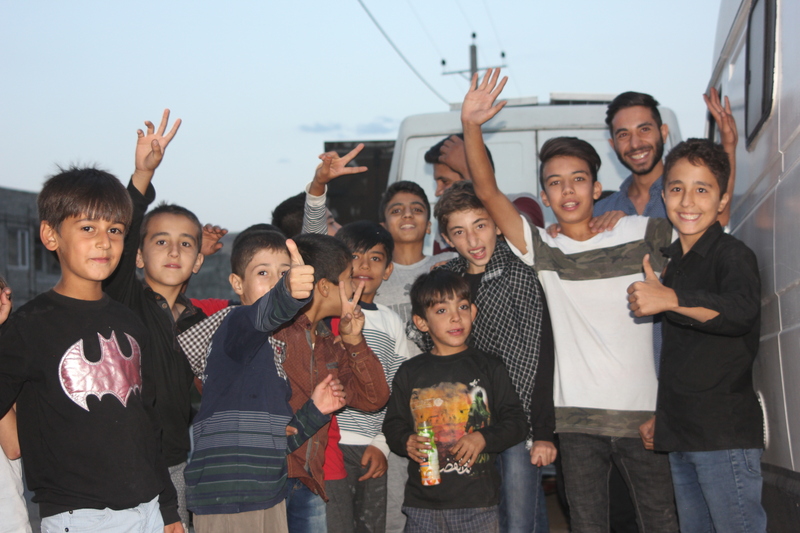 We want to ride thirty kilometers after the border to settle for the night. We will wait until tomorrow to change money and try to get a sim card, for now we just want to unwind around a good … tea! We park near the town of Maku, a little out of the center, near a river in a neighborhood that seems quiet. Frightened by our dogs at first, they will quickly become comfortable once we show them that they are harmless if we are with them. Iranians do not have the concept of the pet dog at all. So imagine children discovering six dogs that respond to their name and bring a stick when thrown! The dogs will have been the “starter”, now it’s us who intrigues them. We quickly go from a dozen children to twenty and then thirty! The knowledge of our presence spreads in the neighborhood like a wildfire. Stunned by this intense day, we get carried away in this new stream or we do not really understand what happens to us. Suddenly, far off the street resounds with drums and songs with mystical intonations. It’s a fanfare carrying huge green and black flags heading towards us. The fanfare mixed with the cries of children becomes a rather deafening noise but not so unpleasant. We are conscious of living a unique moment, and we are lost by the questioning and the desire to share what the children transmit. No longer having a notion of time in this day, we do not really know how long we have been the neighborhood’s darling, but we are beginning to experience the exchange is becoming more invasive. We begin to tire, and want to eat a quiet meal. It will not be for tonight, the only solution now is to go to sleep if we want peace. We will have a last visit before closing our doors, the police who bring us a basket of fruit to welcome us. 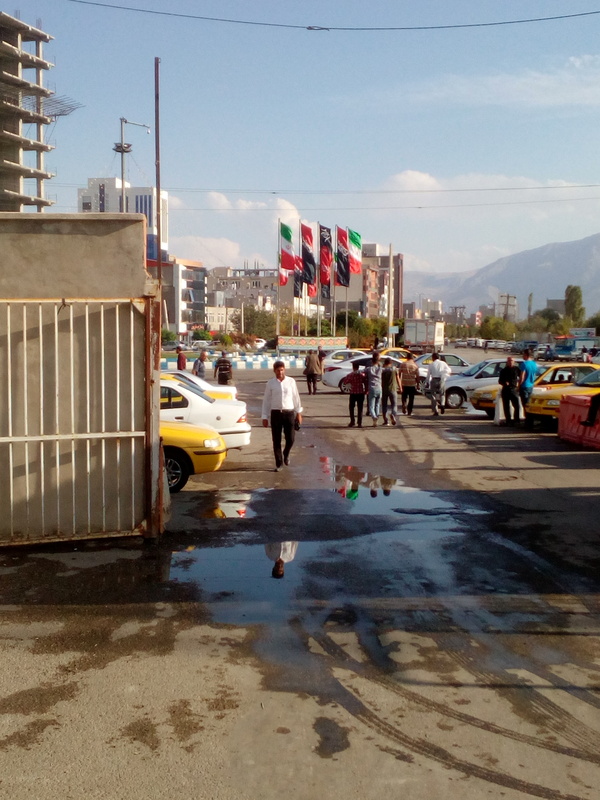 We have often read that Iran is the land of paradoxes. It is the same for the emotions of this first day. We go to bed without knowing what time it is since we did not change the time of our cell phones at the border. Iran is + 3h30 from France or Holland, + 2h30 from Turkey and for the moment + like to rest. The next morning will not be calmer since we will be expected by our team of fans. For my part I will not leave the truck as i’m not able to support this type of exchange on waking. The rest of the team will have no choice because, while they were tracing the route on the map in Marine and Baba’s truck, they find themselves with a dozen people in the living room without even having the time see the curtain closed! 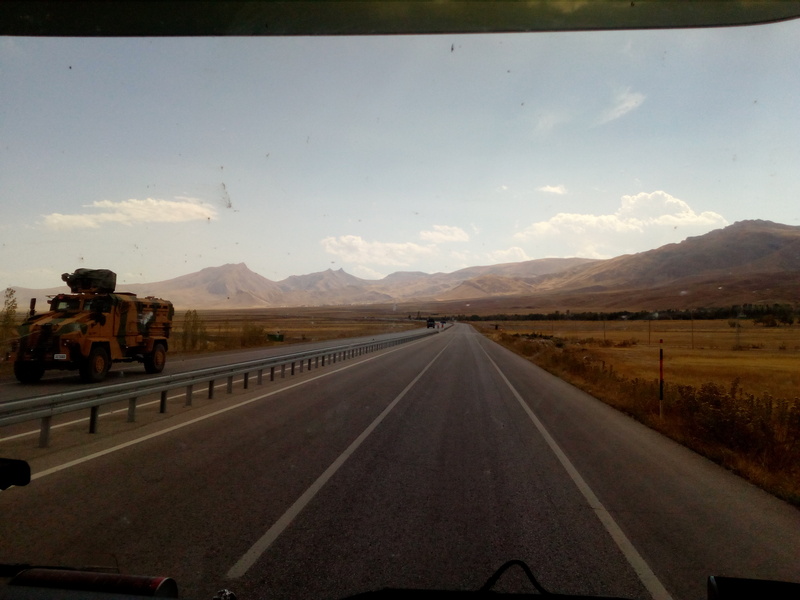 The night may give advice but it does not give you the time, so it is without even knowing what time of day we are, we start the trucks to leave this frenzy to ride a few kilometers towards Tabriz. We take a slap, share between love and detest and drive to new emotions.